Also serving communities of Calabasas. There are 117 Assisted Living Facilities in the Woodland Hills area, with 16 in Woodland Hills and 101 nearby. The average cost of assisted living in Woodland Hills is $4,264 per month. This is higher than the national median of $3,346. Cheaper nearby regions include Canoga Park with an average starting cost of $2,800. To help you with your search, browse the 269 reviews below for assisted living facilities in Woodland Hills. On average, consumers rate assisted living in Woodland Hills 4.0 out of 5 stars. Better rated regions include West Hills with an average rating of 4.3 out of 5 stars. Caring.com has helped thousands of families find high-quality senior care. To speak with one of our Family Advisors about assisted living options and costs in Woodland Hills, call (855) 863-8283. Woodland Hills ranks as one the best neighborhoods in Los Angeles based on its safety, diversity, healthcare, climate and other amenities that may appeal to seniors. There's also no shortage of senior housing in the area, with more than 100 assisted living communities in or near Woodland Hills that are ready to welcome new residents. Called Residential Care Facilities for the Elderly (RCFEs) in California, these assisted living facilities are licensed by the state's Department of Social Services, Community Care Licensing Division. Assisted living communities in Woodland Hills offer activities for seniors, which may include off-site excursions. Aside from shops, restaurants and parks, Woodland Hills has plenty of other recreation options and is not far from famous attractions like the Los Angeles Theater and the Hollywood Walk of Fame. The weather in Woodland Hills is pleasant most of the time, with 275 sunny days, just 18 inches of rain and no snow in a typical year. Summers, however, may be too hot for some seniors, with average high temperatures in July of 92 degrees. The Woodland Hills area is home to world-class medical facilities, including Woodland Hills Medical Center, in the event of medical emergencies or illness. Seniors in Woodland Hills with chronic conditions such as emphysema or asthma may find their symptoms exacerbated by the high levels of pollutants in Los Angeles County's air. The overall cost of living in Woodland Hills is 113 percent more expensive than the national average, although healthcare is about 15 percent cheaper. The Orange Line, which provides seniors with public transportation by bus, has four stops in Woodland Hills. People who are aged 62 or older can get cheaper fares. Assisted Living costs in Woodland Hills start around $4,361 per month on average, while the nationwide average cost of assisted living is $4,000 per month, according to the latest figures from Genworth’s Cost of Care Survey. It’s important to note that assisted living rates in Woodland Hills and the surrounding suburbs can vary widely based on factors such as location, the level of care needed, apartment size and the types of amenities offered at each community. 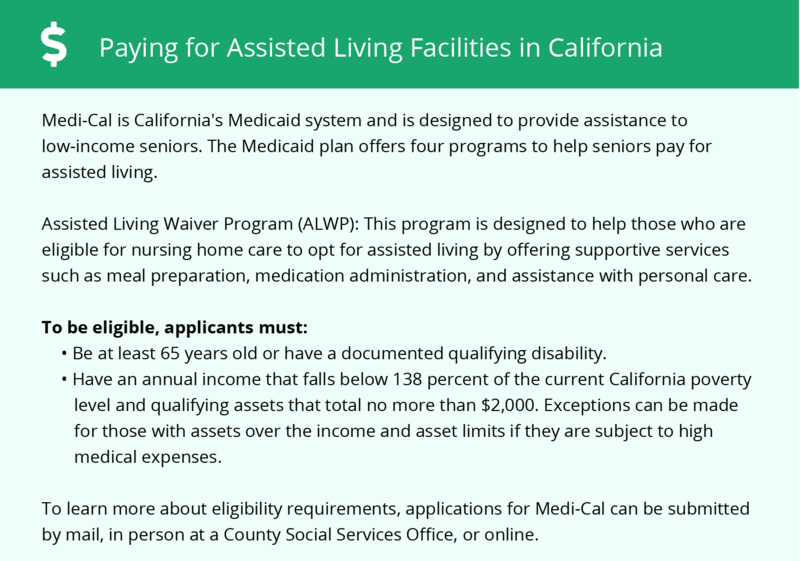 Low-income seniors who meet requirements for California's Medicaid program, Medi-Cal, can apply for an Assisted Living Waiver Program to pay for assisted living services in Woodland Hills. 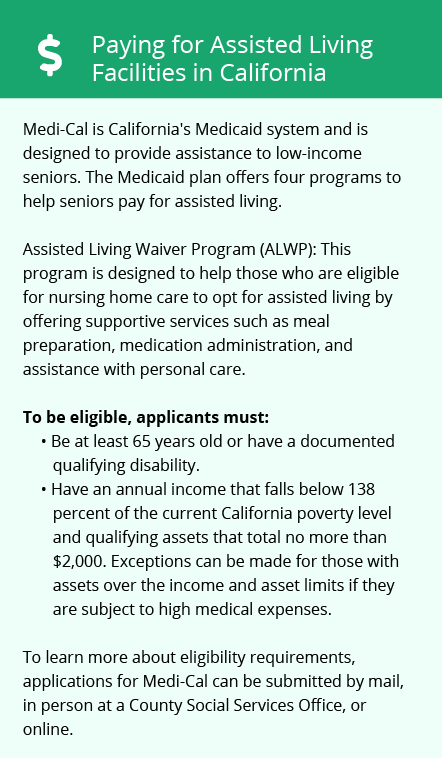 The waiver program doesn't cover room and board, however, eligible seniors may be able to get assistance with those expenses through California’s Optional State Supplement. To see a list of free assisted living resources in Woodland Hills, please visit our Assisted Living in California page. Woodland Hills-area assisted living communities must adhere to the comprehensive set of state laws and regulations that all assisted living communities in California are required to follow. Visit our Assisted Living in California page for more information about these laws.